6 oz. custom chocolate squares gift box. 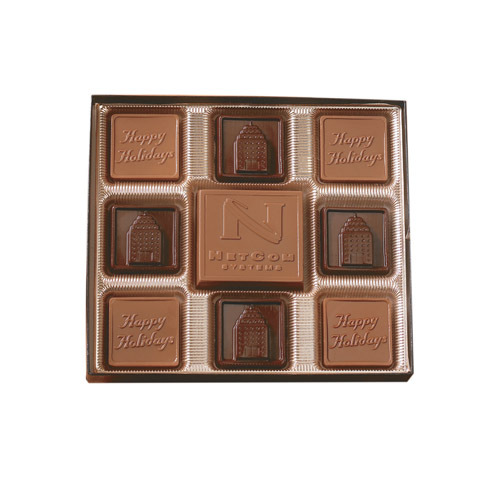 Surround a creamy milk or dark chocolate centerpiece with themed square-shaped chocolates. Select on of our stock 3D designs, a custom logo or both. Maximum of two designs. Each is packed in your choice of silver or gold box with a coordinating stretch bow. Dimensions: 7 3/4" x 7". • Custom Mold Charges are Additional. See Options Tab for Additional Imprint Options and Pricing. • Options: See options for Available Stock Square Designs and/or Customization Charges.